Located only ten miles east of Hood River, the Klickitat is arguably one of the finest summer steelhead rivers in Washington. Originating in the snowfields and glaciers of nearby Mt. Adams, the "Klick” winds its way south until it joins the Columbia River at the town of Lyle, WA. Relatively small in comparison to the nearby Deschutes, the Klickitat is an intimate river. Despite it’s size, endless miles of classic steelhead water make this river a steelheader’s dream..
Steelhead start showing up on the Klick around mid June, however, glacial run-off can blow the river out during the hot summer months. The river can fish well in the mid summer if we have cool evenings and moderate day time temperatures. That said, September through November is prime time to chase some of the largest summer steelhead in the Columbia basin. With fish averaging 8 to 12 pounds and many fish reaching well into the teens, fighting a Klickitat steelie is a bit like Sumo wrestling in the back seat of your car! 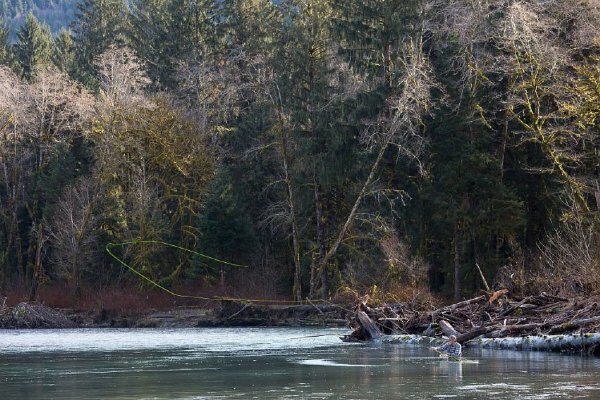 While steelhead are the main draw for fly fishermen this river also hosts runs of spring Chinook salmon, fall Chinook salmon, Coho salmon, and a modest population of native rainbow trout. With multiple species of fish, incredible scenery, and beautiful water, the Klickitat valley is a wonderful place to spend an Autumn day. It’s an experience you don’t want to miss. Originating in the snowfields and glaciers on the eastern slopes of Mt. Adams, the Klickitat River winds its way south until it joins the Columbia River at the town of Lyle, WA. Located a mere 10 miles east of Hood River the Klickitat is arguably one of the finest summer Steelhead Rivers in Washington, as well as one of the prettiest. Relatively small in comparison to many of the better known steelhead rivers it is a fly fishers dream with miles of scenic rocky runs and broad tail-outs lined with pine and oak trees. While steelhead are the main draw for fly fishermen this river also hosts runs of spring Chinook salmon, fall Chinook salmon, and Coho salmon as well as a modest population of native rainbow trout ranging up to 18+”. The summer steelhead begin entering the river in June, however the best fishing for them is from early September to the end of November when the river closes to steelhead fishing. Framed in golden autumn colors with strong steelhead waiting to take you into your backing – fishing the "Klick” is an experience you don’t want to miss. Browse these categories under "Klickitat River Steelhead"